Chief Executive Officer of the Berbice River Bridge Company Inc. Omadat Samaroo (left) presents the sponsorship cheque and trophy to Cecil Kennard. Inc. (BBCI) for its Annual Boxing Day horse race meet which will be held at the club’s track, Bush Lot, Corentyne, Berbice. 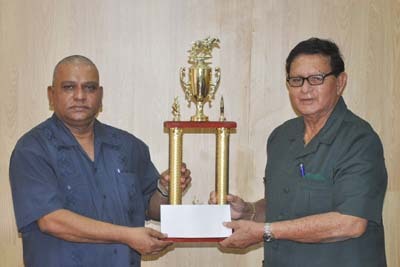 Yesterday at the entity’s head office in Main Street, Chief Executive Officer (CEO) Omadat Samaroo presented the winning trophy and a cheque for $375,000 which will go towards the J1 and Lower race, to organiser of the event and President of the KMTC Cecil Kennard. The winner of that race will receive $200,000, the runner up $100,000, third place $50,000 and fourth $25,000. Speaking at the simple ceremony Kennard said that the meet will feature some of Guyana’s finest bred horses. “It’s essential that we show appreciation to BBCI for supporting the event because no sporting activity can be successful without its sponsors,” he added. CEO, Samaroo said that the company is pleased to once again support the Club. “This event creates immense attractions not only to Berbicians, but those fans that come from as far as Suriname. The proceeds will be used to maintain the track and other facilities there,” he pointed out. Meanwhile, organisers have added a race for K Class animals and several changes were made to the original programme; the feature A3 and Lower race to A1 and Lower while the G1 race has now been replaced by the F1 race. The feature event will run for a distance of six furlongs and carries a top prize of $1 million, while the second place finisher will pocket $500,000, third and fourth will receive $250,000 and $125,000 in the order. Other events billed for the day are the D3 with a top prize of $500,000; the G3 for a $300,000 winner’s purse over five furlongs and the J3 for which the champion will take home $150,000. The owner of the winning horse for the I1 and F1 races will collect $250,000 and $320,000 respectively. Registration closes on December 20, and no late entries will be accepted. Kennard also indicated that systems are already in place for the event and indicated that a massive renovation to the tune of $1.2M is currently being undertaken at the facility.